For as long as I can remember, people have been dreaming of creating flying cars. It truly is the stuff of science fiction. Unfortunately, all attempts at building such a hybrid have pretty much failed. They neither perform well as a car nor as a plane… and they are pig-ugly to boot. 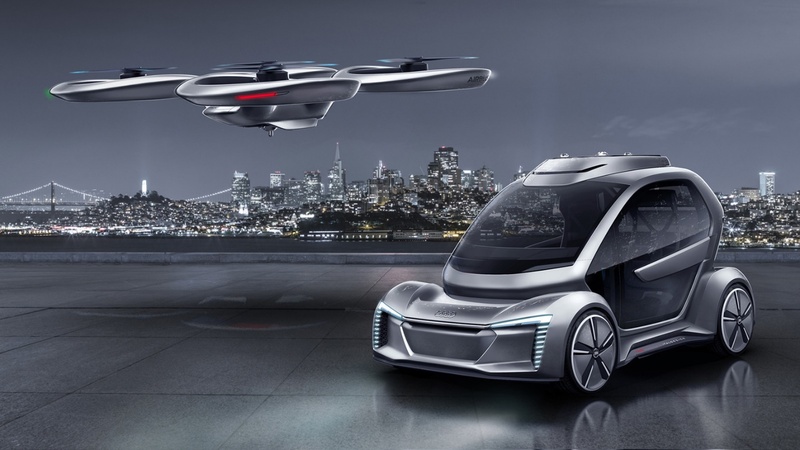 Airbus, Audi and Italdesign have come up with an altogether smarter concept called: Pop.Up Next. And their concept really does have wings (or more accurately rotors) because it starts out as a genuinely good design rather than a botched, back-yard compromise. The car section – thanks to Audi and Italdesign – looks funky and performs well. It would be highly desirable even if it didn’t take to the air. And then we come to the clever part. The cool car is mated to a stylish quadcopter designed by Airbus – a company that knows a thing or two about flying. Both elements – car and quadcopter – have their own battery power packs ensuring that, in road and flight mode, they can deliver a very respectable mileage. But where the concept really takes off is in the vertical plane. The inspired part of this design lies in the four rotors that provide vertical lift-off and landing. This instantly eliminates the need for runways and creates the first truly versatile vehicle for land and air. What’s more, there is talk of drawing upon Audi’s expertise in autonomous vehicles to come up with an ‘auto-pilot’ programme. Now a pilotless airborne car may send a shiver down some spines but it could also eliminate the need for a pilot’s licence – one of biggest obstacles to flying car development. So, what’s the take-home message? Well, to me, this story proves the adage: if you want to be a successful pioneer, first look for proven technologies. A lot more progress can be achieved through a marriage of existing, well-tested tools than by developing unproven all-in-one devices that are possibly flakey and fragile. And to prove that point, let me provide another example of more down-to-earth connectivity – this time between a modern smart phone and a modern car. As I was driving, a voice alert informed me that I had received a WhatsApp from Cristina (my partner) and then asked whether I would like to hear the message. I gave a verbal “Yes”, listened to it and was then given the option to reply. My verbal response was then displayed back to me for cross-checking before my final instruction to send. Slick and impressive. Throughout the whole of my journey Android Auto made my phone ‘inaccessible’ to me, which is a major safety aspect of this system. After a most enjoyable dinner, I then settled back in the car to head home. But, once again, the technology was ahead of me. The instant I re-connected my phone to the car, it deduced that I was heading home and pre-loaded my route. Clever. Perhaps the most remarkable aspect of this story is not the technology but the surprising absence of hype and hyperbole. There was no big pre-announcement about this capability from Samsung, Google or Ford. No flashy promotions and media hysteria. It simply crept in and quietly got on with the job of improving our lives. All of our lives – because you don’t need an expensive smart phone or car to benefit. Cristina has an old Samsung phone and a VW Polo and it works just as well for her. My reason for recounting these stories is simple. I want to encourage people to stop working towards bespoke ‘all-in-one’ devices which invariably prove to be costly, sub-optimal and ugly. Instead, look for greater degrees of connectivity between proven devices. Concentrate on tested technologies, adopt IoT devices and your ideas really will fly.